Pipeline plans and a proxy war with Iran could be motivating factors in the America's continued support of genocide in Yemen. This week, the mainstream media has finally started to report on the growing humanitarian crisis in Yemen, after the details of a school bus bombing carried out by US forces and their allies went viral online. At least 43 people were killed in the attack, with the majority of the victims being under the age of 10. An additional 63 people were wounded in the attack as well. There is a great deal of confusion about what it is taking place in Yemen, and much of this is by the intentional design of the US military industrial complex and their lapdog mainstream media. Since early 2015, a coalition consisting of forces from the US, Saudi Arabia, and UAE have been bombing Yemen on a regular basis, and have worked together to set up a blockade that has cut the country off from the world, causing mass starvation and disease. Despite the fact that the US government is the most powerful player in the coalition who is providing all of the weapons and intelligence, Saudi Arabia and the UAE have taken the brunt of the blame in western mainstream media, allowing war crimes to go unnoticed by the majority of the world for years. This week, Democratic Sen. Chris Murphy announced that he would be making an amendment to the 2019 Defense Appropriations bill which would attempt to would cut off United States’ support for the Saudi Arabia-led coalition’s war in Yemen. Although, President Trump has said that he would disregard congressional restrictions in the defense bill that were related to the war in Yemen. “Last week the Saudi-led coalition in Yemen bombed a school bus, killing 44 innocent kids. And they did it with U.S. supplied bombs, intelligence support and mid-air refueling,” Murphy Tweeted. Sadly, the conquest of Yemen seems to be something that this attacking coalition is not willing to take off the table, and there are a number of possibilities as to why they are so determined. Thus far, the most popular explanation has been that the US and Saudi Arabia were both threatened by the attempted Houthi takeover of the Yemeni government which began in 2014. Prior to 2012, when a revolution swept the country, the government in Yemen received financial and military support from both the US and Saudi Arabia and were generally compliant with western military and business interests. The Houthis seemed to be winning the civil war to take power of the country following the revolution, when the Saudi led coalition stepped in with military support to help restore the ousted government and their loyalists. The Houthis have long been rumored to receive support and funding from the Iranian government, which naturally makes them a target for both the US and Saudi Arabia. The blockade and bombings that have taken place in the years since are simply extensions of this civil war, where the coalition is hoping to prevent a Houthi takeover. Sadly though, the coalition fighting to restore the traditional government does not seem to care if they kill everyone in Yemen in the process. A recent report from Aljazeera reveals that this coalition has possible financial motives in the region as well. Sources told the news agency that there is evidence of Saudi Arabia planning to build an oil port in an area of the country where coalition troops are stationed. These details matched with previous reports of plans to build a pipeline through the region indicate that financial interests and conquest for resources is a major motivation for the outside forces in this civil war. Plans of a pipeline date back to at least 2008, when a classified State Department cable sent from the US embassy in Yemen to the Secretary of State was obtained and published by Wikileaks. Michael Horton, a senior analyst on Yemen at the Jamestown Foundation explained the potential strategical and economic power that a pipeline through this area could provide for Saudi Arabia and its allies. “The kingdom’s primary interest in the governorate is the possible construction of an oil pipeline. Such a pipeline has long been a dream of the government of Saudi Arabia. A pipeline through the Hadramawt would give Saudi Arabia and its Gulf State allies direct access to the Gulf of Aden and the Indian Ocean; it would allow them to bypass the Strait of Hormuz, a strategic chokepoint that could be, at least temporarily, blocked by Iran in a future conflict. The prospect of securing a route for a future pipeline through the Hadramawt likely figures in Saudi Arabia’s broader long-term strategy in Yemen,” Horton commented in a 2015 report. Hadramaut is Yemen’s wealthiest region, an is responsible for 80% of its oil exports, and accounts for 50% of its landmass. The Asia Times reported that neighboring Oman signed a pipeline agreement with Iran in 2014, making Saudi Arabia more desperate to use Yemen as their pathway. 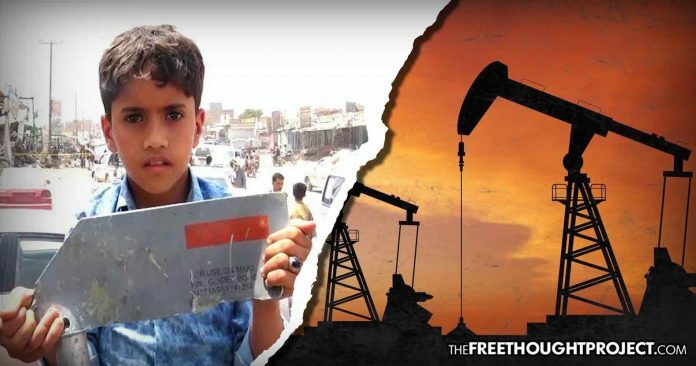 Another point that is quite telling, is the fact that Hadramaut, the region that holds the vast majority of the country’s oil resources and infrastructure, has not been targeted with any airstrikes as if they were intentionally trying their best to keep those assets intact.